Porcelain veneers are a common cosmetic dentistry procedure that can improve the appearance of your smile. Dr. Bowyer has performed many of these procedures in the Vancouver, WA area, and is accepting new patients. 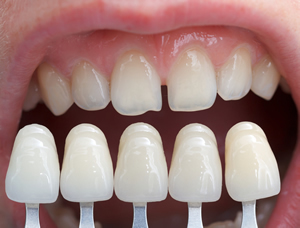 Think of porcelain veneers as a contact lens for your teeth. In this procedure, a thin piece of porcelain is applied to the front of each tooth to improve its size, shape, or color. A very small amount of the original tooth enamel is removed to make a surface for the veneer to adhere to. The porcelain is then applied with a resin and is hardened with a special curing light. Porcelain veneers are a good option for patients who have damage to the visible surfaces of their teeth, have gaps between teeth, or have tooth stains that have not been resolved by tooth whitening or bleaching. If you would like a free consultation to see if porcelain veneers are right for you, contact Dr. Bowyer at his Vancouver clinic. Call our office at (360) 253-2640 or use the form to schedule your appointment.